The Rectangle Tool allows one to draw rectangles and squares. Basic use of the tool is introduced in Chapter 1, Quick Start. To draw a rectangle or square, select the tool by clicking on the icon (F4 or r) in the Tool Box. To draw a rectangle, use a Left Mouse Drag from one corner to the opposite corner. To force a square to be drawn, hold down the Ctrl while dragging the mouse. This also allows rectangles with an integer height to width or width to height ratio to be drawn. As a special case, rectangles with sides constrained to the “Golden Ratio” are also allowed with the Ctrl key (as of v0.46). Holding the Shift key down while dragging will create a rectangle centered around the starting point. The size of a preexisting rectangle can be changed by selecting the rectangle via a Left Mouse Click on the rectangle with the Rectangle Tool. Once the rectangle is selected, handles (small squares and circles) will appear at some of the rectangle's corners. Left Mouse Drag the handle (square) at the top left or bottom right to change the size of the rectangle. 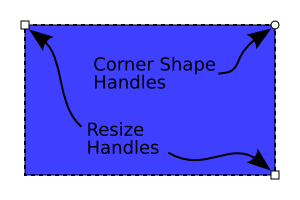 A rectangle showing the Resize (square) and Corner Shape (circle) handles. A rectangle can be given rounded corners. There are two ways to do this. The first is to use the handle(s) at the top-right corner of the rectangle. Initially, only one handle is visible. If this handle is dragged down, a rounded corner in the shape of a quarter circle is created. A second handle is now visible. Dragging this second handle to the left will create an elliptical rounded corner. Upon dragging the second handle, the radius of the curvature in the horizontal (x) and vertical (y) directions are independent. 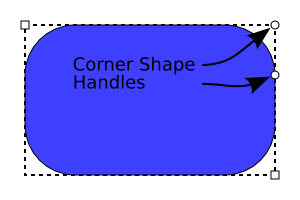 A rectangle with circular rounded corners. 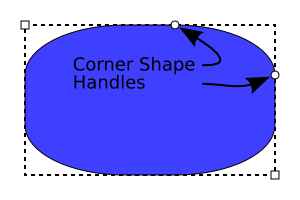 A rectangle with elliptical rounded corners (different x and y corner radii). A second way to set the radius of curvature of a rectangle is to use the settings Rx and Ry in the Tool Controls when the Rectangle Tool is selected. The settings will affect any selected rectangle as well as rectangles that are drawn afterward. Rounded corners can be removed from a rectangle by using the Square Corners button ( ). The width and height of a rectangle can also be set using entry boxes in the Tool Controls. If you want the rounded corners to scale with the rectangle object, you must toggle on this option using the icon that is in the Tool Controls when the Select Tool is in use.